Extracted wax gland scent located inside the cleft of a doe’s hoof. Doe are very inquisitive of a strange doe’s scent in their territory. 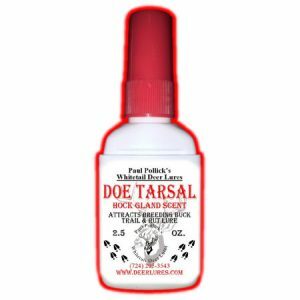 This natural hoof musk scent holds great interest all season and poses no threat to her. 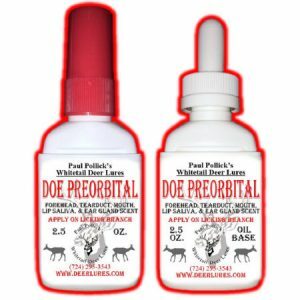 Hunters, there is nothing you have ever used that is more effective at bringing doe to your stand. 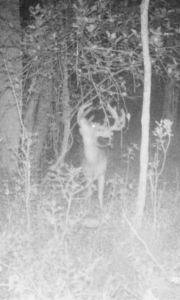 This is also the natural trail buck follow during the seek and chase period one or two weeks before peek rut. It has a small amount of doe-in-estrus urine for added interest. 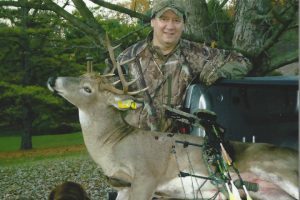 Lay a scent trail upwind of your stand and then re-saturate and hang in a shooting lane. 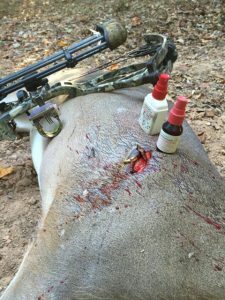 NOTE: These tinctures may be used separately or in combination with any buck or doe urine to blend your own custom lure. 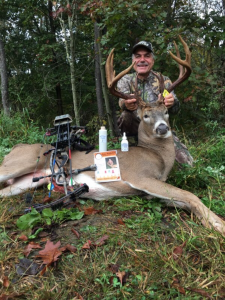 This is my second buck with bow of the 2015 season. It’s a nine point. It was taken on Dec 9th. Notice your felt boot pads on my boots. I saturated them one with Doe Interdigital other with Buck Interdigital as you see it works. Your products are a major part of my bowhunt! 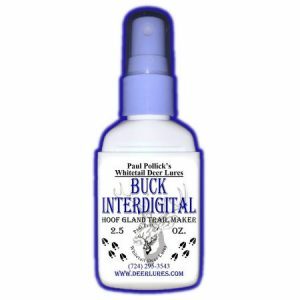 Your Doe Interdigital Scent is deadly on big mature Nanny heads. 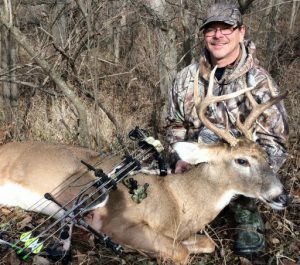 When the scent drag is placed in a loop around your stand and stops in your shooting lane, the deal is done. Great product Sir! I laid a scent trail of Doe Interdigital and Complete Scrape to a mock scrape that I created, scented with Buck Preorbital and Complete Scrape. He followed the trail in and I shot him within 20 yards from the scrape.